I very much enjoyed Duane Swierczynski's first New 52 Birds of Prey collection. After so many years of Gail Simone writing the series (and then some less-than-stellar fill-ins), I wasn't sure about yet another writer taking over the group; Swierczynski's story, however, deftly mixed humor and espionage, and his new character Starling seemed like someone Simone might have created herself. But Swierczynski's second volume, Birds of Prey Vol. 2: Your Kiss Might Kill, didn't thrill me quite as much. Swierczynski writes a respectable Birds of Prey, with no embarrassing out-of-character moments; still, the book feels rushed, is perhaps too vague on one of the story's most important elements, and treads too long on a lesser storyline that isn't as interesting. As well, most of this volume trades artists Jesus Saiz and Javier Pina for Animal Man's Travel Foreman and a host of fill-in artists; I like Foreman's work a lot on Animal Man, but he's a mis-fit for this superhero title, and the multitude of guest artists contribute to the book's hurried, slapdash feel. The first chapter starts "three days ago," in which a spy agent finds one of his group murdered, with evidence pointing to Black Canary. "Now," Canary and the Birds have been lured to the hotel where the man was killed, and then attacked by the group's super-powered "Infiltrators." The victim, we learn as Starling investigates separately, was Canary's husband Kurt Lance; in the end Canary admits to the Birds that she did indeed kill Kurt ... three years ago. The most likely explanation is that this is simply a gaffe, and the issue is supposed to begin "three years ago." But I can't be sure -- the agent who finds the body refers to Canary striking "again" and that they need to "burn her" (the present attack involves fire), such to suggest a more immediate cause and effect. If Kurt isn't the victim, then Canary has killed someone else, and while there's (a little) more about Kurt later in the book, there's no mention of Canary's possible second victim at all. All of this simply starts off the book on the wrong note; it's hard to get into a story when the basic tenets of who did what aren't clear. The next chapter is Birds of Prey's "Night of the Owls" crossover issue. While there's a nice callback in this issue to the series's first issue, Travel Foreman takes over art here, and his grotesque figures, which work in Animal Man, seem baseless in Birds; see Canary on the fourth page, bent nearly in half, animal-like, while simply walking. Again, no major flaws in the writing, but it's not a remarkable issue (as many of the "Night of the Owls" tie-in issues weren't) and it distracts from the more-interesting story about Canary and her late husband. Swierczynski never quite returns to any of that in force, because the penultimate three chapters involve the Birds taking Poison Ivy to the Amazon for healing, and Ivy subsequently blackmailing the Birds into a bit of eco-terrorism. This is interesting, and I rather like Swierczynski's portrayal of the Birds as heroes on the wrong side of the law. They disagree with Ivy's methods but perhaps see some justice in what she does; there's also an undercurrent of danger (a la Simone's Secret Six) where the reader feels at any time one of the Birds might slip and kill in cold blood. But again, the story suffers from a variety of mismatched art teams, some of whom draw the Birds in gratuitous cheesecake fashion (when Saiz and Pina never had such problems). There's also more story confusion -- one accomplice of Ivy's refers to talking to the Birds before, though I can't at all find him elsewhere in the book. And the story suddenly jumps in the final part from the Birds doing Ivy's bidding to standing around while Ivy rests, able to finally free themselves; it's a sudden shift that I suspect emerges from the book losing an issue to "Night of the Owls" or something else. Your Kiss (a title never really explained) ends with the book's Zero Month issue, and it might be the best of the bunch. It reminded me of some of Chuck Dixon's original Birds of Prey specials; here, Canary infiltrates the Penguin's organization to stop a weapons sale, meets Starling, one of Penguin's enforcers, and runs afoul of Batgirl. When Batgirl and Black Canary met in the "old universe" is a story slightly muddled, so it's nice to see a real concrete "origin" for the characters; Swierczynski also teases some ties to the Suicide Squad title, which I liked. Artist Romano Molenaar's style is closer to what I expect from Birds of Prey (though over-inked), but a silly unnecessary shot of Canary in her underwear late in the issue knocks my opinion of his art down a peg. 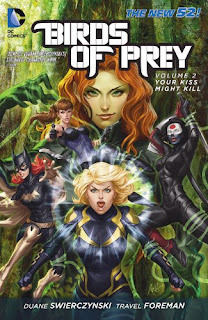 Ultimately Duane Swierczynski's Birds of Prey Vol. 2: Your Kiss Might Kill isn't bad Birds of Prey, but neither is it good Birds of Prey, either. Swierczynski abandons too quickly the most exciting part of the book, the circumstances around which Canary killed her husband, for a Poison Ivy story that's interesting but doesn't have the verve of the first volume's mind control intrigue. Swierczynski still has one more collection of Birds of Prey to go; hopefull the third mimics the first more than it does the second. Up next, Green Lantern Corps Vol. 2: Alpha War. Don't be late! It's a shame that Molenaar only starts drawing the series at the end of this volume. He's a pretty good penciller, and his art gets even better once Jonathan Glapion replaces Vicente Cifuentes (whose heavy, overbearing inks have never been to my liking) as the book's regular inker. Glad to see, after the artist shake-ups in this volume, that Molenaar has stuck around for a while. Probably that was an argument toward putting the Zero Month issue in the next volume, not this one. I liked tis volume, but was a bit disappointed that the story threads from last volume weren't really continued. Hopefully Swierczynski's final collection will conclude that. All the mind control stuff? Yes indeed, that was the best part of Vol. 1. Preliminarily it doesn't look to me like the final volume goes there; seems to me it's more about some new members and Black Canary's past.